When a SharePoint List/Library is marked hidden, SharePoint simply removes there navigation point from the SiteContents. The actual List/Library still continue to exist at their respective urls, the format of which remains in sync with any other SharePoint List/Library. 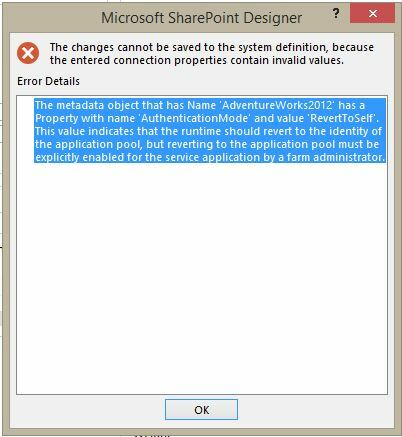 I was trying to change the Authentication Mode of one the External Content Types (BCS) to ‘BDC Identity’ through SharePoint Designer, when this error was thrown. The solution was to set the revert to self option of the BCS service to true. To do that, run the following in the Management Shell.